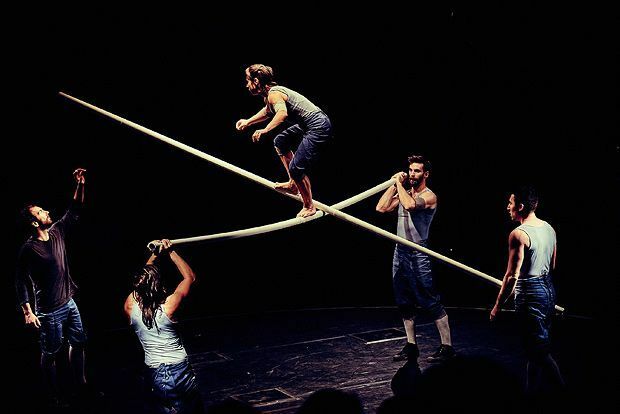 The theatre of Tipping Point, as with any other Ockham's Razor piece, begins long before the show opens, even before the experimentation of movement started in the rehearsal room. The company devises and builds its own circus equipment for each show; in the case of Tipping Point, it's a collection of bright white posts, which are manipulated through the piece into Chinese poles, tightropes, see-saws, and all manner of other curious and wonderful inventions. There is something quietly brilliant about Ockham's Razor that makes this show an understated triumph. They start by drawing a circle out of salt or chalk to form the walls of their stage; periodically they clap puffs of this same substance, filling the air with smoke. The show is full of these simple mystical symbols, such as when they make a switching labyrinth of balance ridges for Emily Nicholl to find her way across, or when in unison they all swing the poles. The tipping points are varied; sometimes a joke is pushed too far and a group member stands aside, hurt. Sometimes it's all about avoiding a moment of collision. But when Alex Harvey and Nich Galzin take to a mechanical see-saw – a sort of pared-down version of the classic wheel of death – you can see that the tipping points we're witnessing are very real, and that no choreography can prepare you for the act of having to find balance in a live moment. This is followed by a breathtaking moment of ingenuity and intimacy as Nicholl uses Harvey's forearm as a trapeze, knotting the pair together tightly. Four parts creative inquisitiveness and one part showmanship, the members of Ockham's Razor sometimes seem more like scientists or mechanics, testing, pushing, exploring, rather than posturing. Rare and special, Tipping Point is an extraordinary ode to the beauty of balance. C scala, until 25 Aug (not 16, 23), 3pm, £14.50–£16.50 (£12.50–£14.50).